Rising costs, increasing variations and complexity of healthcare systems are seen in many industrialized countries in recent decades. They may be caused by many social and economic factors including population ageing, people’s increased mobility and economic downturn that are concerning all of us. What are healthcare systems? How do they affect our society and individual lives? The AIU Invited Overseas Lectures Series, funded by the Global Human Resource Development Program, aims at providing expert guidance from all over the world for students to learn about issues like these. 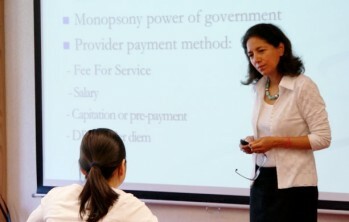 An intensive course (14-18, September, 2015) titled, ‘Introduction to Healthcare Policy and Systems’, was taught by Professor Rebecca Surender, an Associate Professor and Head of Department at the Department of Social Policy and Intervention and a Fellow of Green Templeton College, the University of Oxford, UK. She has been a Pro Vice-Chancellor and Advocate for Diversity of the University from February 2015. She is also a Visiting Professor at the Institute of Social and Economic Research (ISER) at Rhodes University, South Africa. Prof. Surender is an expert in medical sociology and comparative health policy with a particular emphasis on South-African health policy. This course aimed at increasing the understanding of and analyzing the health policy and its processes and politics, particularly in Western industrialised societies. It started with the overview of western healthcare systems and their similarities and differences, and discussed a variety of ways they deal with the issues of finance, quality, and equity. The course concluded with student presenting their research: exploring cases from the point of viewof efficiencies, effectiveness and equity of healthcare systems. Prof. Surender said students seemed comfortable with a seminar style class and, although their background knowledge on the topic was limited at first, they worked hard on reading assignments and learned quickly. A student reflected and said Prof. Surender made the complex subject easier to understand, and several students expressed that the course made them become interested in learning about the Japanese healthcare system as well. Healthcare and welfare policies will increasingly be a part of important social concerns and this course experience was meaningful for AIU students to become future leaders. Besides her teaching, AIU faculty members had the opportunity to learn about her involvement in university reform on diversity at Oxford. We hope to continue this meaningful interaction with Oxford University in the future.